Last fall, a researcher presented her work at a surgery conference, and a reporter for General Surgery News decided the study was worth a story. Soon afterward, the reporter submitted the story to General Surgery News editor Kevin Horty. In the meantime, the researcher had contacted the journal where she’d submitted the work, to make sure that a General Surgery News story wouldn’t be considered “prior publication” and jeopardize her ability to publish the paper. Sorry, the journal responded, it would: A few months had passed, the presentation was no longer news, and that the story would be considered prior publication because it would contain material that wasn’t in the conference abstract. The researcher shared that with the reporter, who shared it with Kevin. 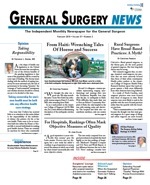 General Surgery News had just been Ingelfingered. Franz J. Ingelfinger, M.D., (1910-1980) was editor of the prestigious New England Journal of Medicine (NEJM) from 1967-1977. During his tenure he decreed that for an article to be published in his journal it must not previously have appeared elsewhere. The rule prohibited authors from releasing their results to the news media before the date they were published in the journal. A small number of other journals (such as JAMA) developed similar policies, and the net result is that scientists are often afraid to talk to reporters for fear that they’ll lose the opportunity to publish in JAMA or NEJM (or Nature or Cell or Science). Whatever motives Dr. Ingelfinger had when he originally promulgated his rule, the current effect is to stifle dissemination of research results to the public that, in most cases, paid for that research, and to increase the influence of a small number of journals at the expense of the public’s right to know. Bob’s post includes a boilerplate letter he sends to any researcher who responds to an interview request in a way that suggests Bob is about to get Ingelfingered. Here’s what Kevin did: He wrote the journal, saying it was his understanding that the newspaper could report on anything presented at a conference. The story wouldn’t include anything that wasn’t in the researcher’s PowerPoint presentation, he said. He didn’t hear back from the journal for weeks. When he finally did, the editor in chief, through an assistant, said the journal was just following the rules of their publisher, who also has other journals. Kevin asked to see that policy, which turned out to be a fairly typical interpretation of the Ingelfinger Rule, one that says anything presented at a meeting does not constitute prior publication. In this case, however, the editor added that it was the journal’s judgment that this would violate that. When he politely told the journal he disagreed, they put him in touch with the press relations officer for the publisher. Reviewing the situation, that person told Kevin and the journal’s author that General Surgery News was well within their rights to go with our story. News reports based on conference presentations appear all the time, and most don’t trigger any rejections, although it’s of course hard to get specific numbers. What seems to have been different this time was that the author asked the journal for permission. If scientific news is so good (and the journalist is convinced it’s valid) that it gets press based on early conference reports, that should be viewed as extra publicity for the journal, much the way Hollywood studios benefit from early buzz. I can only see it resulting in MORE media attention once the study is actually published, because more people are aware it’s coming. In my experience with scientific journals, these policies are all bark and no bite. To allay the fears of scientists worried about getting Ingelfingered (is that correct usage? ), one reporter I spoke with recommended keeping a list of conference stories that went on to be published in big journals. Seems to me that the author, trying to do the right thing, fell victim to the rule that no good deed goes unpunished (or maybe that should be “unpublished.” Having done my time as an embargo enforcer at JAMA, and having helped many a researcher navigate the prior publication rules at many major journals in several positions since, the unnamed journal’s initial response as cited in this case seems to me to be odd. Perhaps, in the follow-up, that became clear. News coverage of research presentations at professional meetings, as you note, traditionally is not consider prior publication. Nor have researchers who speak to reporters about their work and stay within the bounds of their presentation generally, in my experience, found themselves blacklisted when they finally submit their papers. Not that they aren’t afraid of that happening, all these many years after the Inglefinger rule was promulgated, as Larry Altman has often pointed out. I’ve had any number of researchers make that clear to me, in my many years as an editor and publisher on the trade and professional side, even as I cited chapter and verse and personal, official experience of how to get the job done without risk of being shut out of a journal. I often counseled touching base with journal editors and media offices to seek reassurance; looks like that backfired here. Perhaps our new wired landscape will eventually open things up more over time, given the speed at which important medical information moves from formal presentation to potential use in practice via professional communications channels that might not always have the gleam of a major journal but are highly authoritative, credible and, perhaps most importantly, increasingly useful to clinicians on the front lines. Huh – that’s interesting. I always thought that an ingelfingering (oh for a different phrasing) was something that happened to a scientist not a reporter. I have now been enlightened as to the correct usage. I find the Ingelfinger rule fascinating – it’s essentially a pre-embargo embargo, isn’t it? I wasn’t familiar before with the “Ingelfinger” terminology — thanks for defining it! Fear by space scientists of Nature or Science refusing to publish their work because of “prior publication” is one of the two biggest concerns that they have about the new policy imposed by NASA to release raw versions of spacecraft images in near real time. Images from the Mars Exploration Rovers and Cassini Saturn Orbiter (among others) are posted on the mission websites within 24 hours of their arrival on Earth. The MER team has always welcomed the public to explore and analyze these photos, but the Cassini imaging team has been very active in attempting to prevent bloggers and other members of the public from processing and analyzing their images, usually on the grounds that such analysis violates their proprietary data period and may result in Science and Nature determining prior publication for the images. I think this is just a smokescreen, but that’s their argument. Ivan, you’ve described an extremely frustrating obstacle that medical journalists run into all too frequently. I recently blogged about my own similar experience: http://bit.ly/4VT458. In this particular case I was writing for a trade publication similar to the one you mention in your blog. However, it does open an interesting discussion about the issue of reporting on studies before they have been peer reviewed. Certainly, being selected for presentation at a conference is an early form of peer review, but many such studies never make it into medical journals. When I write for physicians I am confident that my audience understand this. But I also write for the lay public. Is this pre peer-review research too preliminary for them?